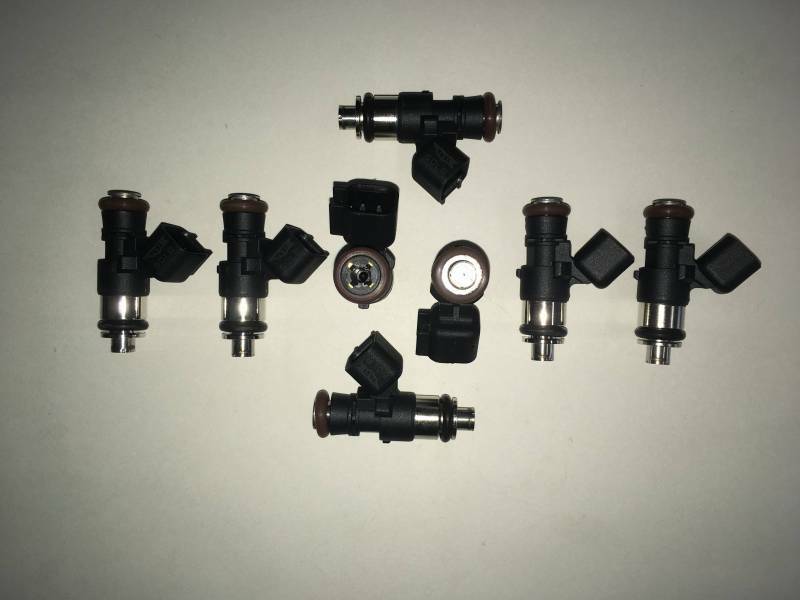 This is a set of 8 TREperformance Short/Stubby/Pico EV6 80 lb/hr High Resistance, saturated fuel injectors. These are the newer style short skinny injectors, with EV6 electrical connections and an upgraded single fuel delivery nozzle for superior fuel atomization. All TREperformance injectors are tested and flow matched at our Southern California warehouse on a brand new ASNU flow bench to confirm the flow rates, and typically the system balance is between 1.0% - 3.0% which means you know that you are getting accurate injectors. All injectors require ECU tuning to function properly. Included: 8 TRE 80lb short EV6 injectors. The photo is an example of a similar set. These High Resistance(Approx. 10.0 OHMS) Saturated fuel injectors will fit many applications including 2010-2015 Chevy Camaro V8 & 2010-2015 Chevy Corvette. If your vehicle needs EV6 style injector clips/plugs, please select them from the drop down menu above. These TRE short injectors flow 76 lbs/hr at 43.5 PSI ( 3 BAR ) and up to 100 lbs/hr at 80 PSI! Despite the high flow rate these units are high-impedance, plus they are linear and controllable at low pulse widths and have been used in ULEV applications! This allows you to use a larger injector than normally possible without hurting idle and low speed drive-ability. Adding to the flexibility of application, these units are high-impedance; making them compatible with most ECUs, while delivering the most flow available in a High-Impedance injector.